the Mommy Stories: enjoying maternity leave - make the most of this "downtime"
enjoying maternity leave - make the most of this "downtime"
So you're home with baby. How snuggly and blissful- exhausting and busy of course! It's one of those amazing times, yet so busy and such a blur, you won't remember all of it later down the road. 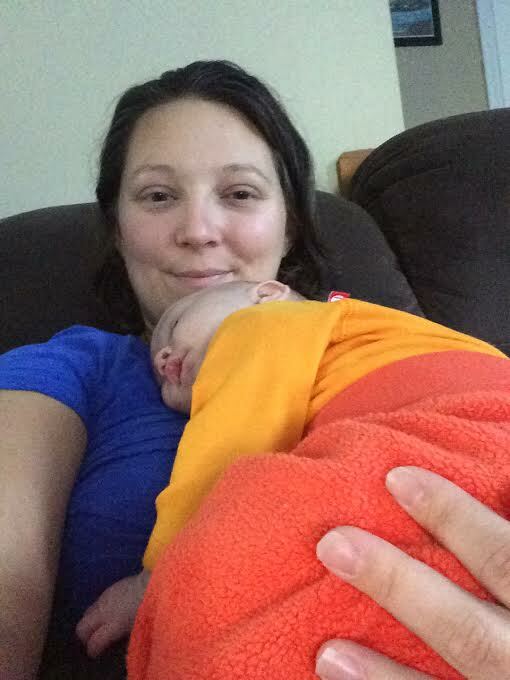 Now that I've returned to work after my third maternity leave of 3 months, I'm reminiscing and realizing I'll never have a time like that again where I'm wearing black stretchy yoga pants every day, barely showering and taking naps in the middle of the morning AND again later in the afternoon. I'll never have a time again where I'm attached to a sleepy, cuddly, yummy smelling newborn. It really is a super busy time, but it's a wonderful bonding and family time, too. Treat yourself often. Every time I left the house and actually got somewhere on time or showered, you better believe I was getting my favorite bagel or iced chai at Starbucks or fancy chapstick at Wax-Mart. It's OK to treat yourself. Get your favorite lunch to go for takeout after you practice getting the baby in and out of the car seat. Stroll through the cute store near the doctor's office just because you can. You are doing A LOT for someone else right now, it's OK to treat you, too. Slowly walk around Target. Ohhh the joys that Target can offer a very tired new momma and a sleeping baby (hopefully)! Enjoy this more than anything else. I went out one day in my pajamas- no joke, what I'd worn to bed the night before - and leisurely strolled Target up and down every aisle, just looking, not needing much of anything. Blissful. Every single other time after maternity leave that I've gone to Target, it's been rushing in and out, quickly getting the vitamins because we ran out at breakfast or speeding toward the back of the store for a birthday present or getting to the checkout line only to remember I didn't get the toilet paper and zooming back for it. Ugh. Target is for leisurely shopping. Enjoy! Update the baby book. Order the pictures of the first bath, the homecoming day, the hospital. You will not have this much time pretty soon, so spend a nap time with baby snoozing and you updating the details of her birth. You will forget those details too soon, unfortunately, so write it down. NAP! Yes, sadly, it took me a few kids in to really learn this lesson- NAP when baby naps! SO important. I get it, SO much to do. Shower even. I get it... but it's NOT worth it. Sleeping IS worth it. Sleep, momma. Sleep! Even if you lay down for 20 minutes, it's better than powering through the cleaning. That cleaning can wait. With my third baby, I napped daily, sometimes 2-3 times a day with him. It was blissful. Sometimes he was in his bassinet next to my bed, sometimes he was snuggled in my arms and I lay staring at him, unable to sleep thinking of how amazing he was. But I NAPPED. It was rest I wish I could get now! Wear comfy clothes only at all times. When else can you do this besides maternity leave? Wear those yoga pants. Keep out the maternity leggings. There is NO reason to wear anything that has buttons or zippers. None. Enjoy relaxing in the clothes. Your body did a lot. Let it be comfy. Eat big lunches. You probably barely got to finish your coffee or bagel this morning. You aren't sure if anyone is bringing dinner or if your other kids will need you to help with homework or something at dinner, so enjoy your lunch solo. Take yourself out to eat even if you can manage getting out of the house with newborn. But eat lunch. A big lunch. Not just salads either, indulge in pasta or large sandwiches on fresh bread and extra cheese. Meet friends out if they are around. But eat. You need the calories to heal and produce milk if you're nursing anyway. Catch up on social media, emails, etc. like it's your job. I updated my address book, deleted the 1230 emails in my account I barely use, and messaged back some old friends who wrote to me a month ago on Facebook. When else will you get a chance to do these things? It'll feel good to get something done like that instead of just cleaning up spit up and poop. Talk about your baby nonstop. It's allllll good! You just brought a new human into the world. OF COURSE you are going to want to talk about that! It's OK to talk about it. Have FUN talking about her or him. Share pictures. Post pictures 5 times a day if you want. Be "that" mom if you have to (I hate that term. I am that mom. I do not care.). It's all good being proud of the little one you created and now have kept alive for 38 days. Be proud and talk about it. Living and breathing a baby in all day long, every hour or two feeding and burping and getting to sleep- it's ALL you're doing. What else would you talk about, the weather? It's OK! Let your body be. Let it recover. Rest. Eat healthy foods and treat foods, it's all good. You will get back in shape LATER. Not during maternity leave. OK this is BIG one to me. I get so frustrated hearing moms trying to get back into shape after having a baby, or wondering why their pants don't fit 2 weeks after popping out a melon. MOMS, do you realize what your body just did? It's OK. I firmly believe 9 months to gain all that weight, AT LEAST 9 months to get it off. And it's OK to not look as strong or feel as muscular. It's OK to have flab around the middle and to not fit into your pants. I've lost ALL the weight by the end of maternity leaves times three... and yet wore maternity pants to work all three times 3 months later. IT'S OK. Our bodies do this huge thing, then they change and change again after baby is out of us. Let your body heal. Focus on your baby. You will get back to being in shape, later rather than sooner. It's OK.